After receiving a distressing video from a young, aspiring actress, Behnaz Jafari’s life is thrown into turmoil. 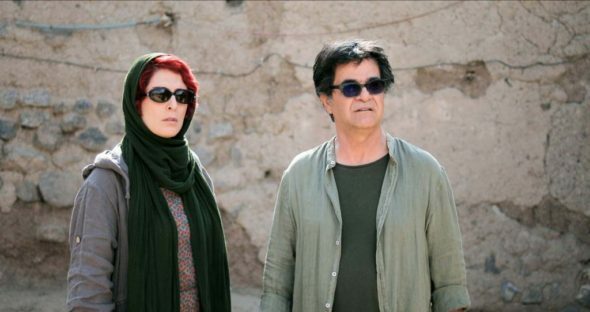 Playing herself in director Jafar Panahi’s largely fictionalized narrative about cultural differences, honor, and the dreams of a young girl, Jafari abandons the set of her current project to travel to a remote village in northwestern Iran. Haunted by this plea for help, she feels compelled to seek out the young woman. Panahi, also playing himself, accompanies Jafari on her search. Though the director is, in fact, in the midst of a 20-year filmmaking ban imposed on him by the Iranian government, he once again manages to make a thought-provoking films examining life in his country. Here he looks at the struggles of three actresses at different points in their careers: a pre-Revolution actress named Sharzad, current star Jafari, and the young actress in need, Marziyeh Rezaei. Rezaei’s won an opportunity to study acting, which her parents have accepted as a condition of accepting an engagement. Learning that her parents have no intention of upholding their end of the bargain, Rezaei’s desperation compels her to reach out to Jafari, whom she believes can help convince her parents to let her go. While searching for Rezaei, Jafari and Panahi find themselves engaging with a number of villagers. Most of the exchanges are comical. The residents are at times star-struck, sometimes suspicious, and often dismissive of the “entertainers.” The conversations revolve around an excellent stud bull, the magical properties of foreskin, and the pretension of people from the city, among other things. These interactions reveal a lot about the people in Rezaei’s village, and the kind of challenges she faces. For the majority of the film, Panahi’s camera focuses on Jafari. Even during scenes where the story seems to follow another character, our focus remains on Jafari. When Panahi does shift focus, it can’t help but draw your attention. Again, during what appear to be meaty scenes – as when Jafari speaks with Rezaei’s parents—we are not privy to the action. Instead, this time, we remain with Panahi as he wanders away from Rezaei’s house and watches Sharzad from afar as she paints. It’s only through a car alarm in the background that we understand the possibility that not everything is well back at the house. Minimalist in style and tone, Panahi’s film still mines the deepest wells of human emotion.